This experimental work is dedicated to Stanley Meyer’s work (the patent US 4798661 and several further ones) and also to Inoue Kiyoshi (the patent US 4184931). There are many descriptions of the similar schemes, created by enthusiasts, who wish to use the water as the fuel. The notion “Brown’s Gas” is also often related with this experiment. The available volume of the reactor is 200 ml. 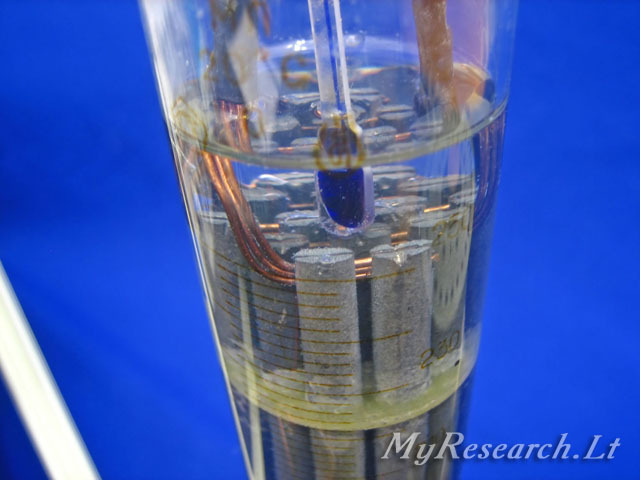 The electric capacity of the dry reactor is 130pF. The reactor is filled in with the distilled water. As per the description, the device must operate on the resonance frequency. 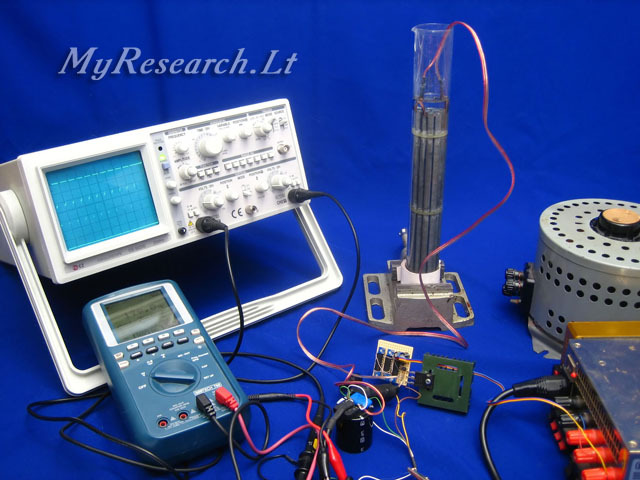 The resonance frequency is ascertained according to reduction of the consumable current. It is ascertained that as the frequency increases, so the consumable current increases gradually; however, it did not work well to detect the resonance in the interval of frequencies from 10Hz up to 500kHz. Serial connection of inductances 10mH and 1H also did not bring to appearance of the noticeable resonance. The temperature of water raised by 6 degrees within 10 minutes of operation, whereas small gas bubbles appeared at the electrodes. As the current increases, so producing of gas increases considerably, up to strong seething; however, the water heats quickly and starts to evaporate. 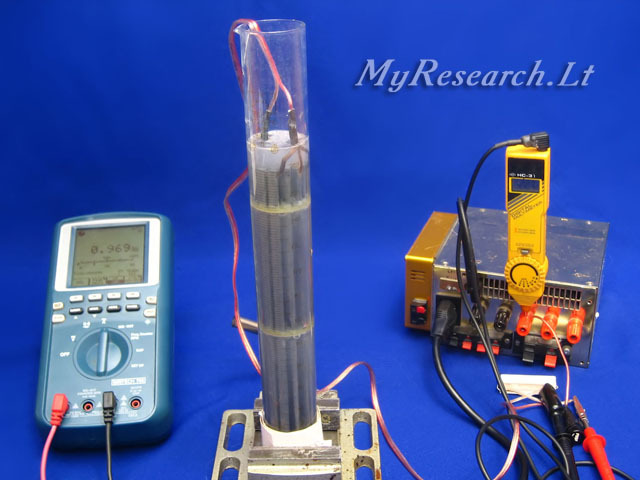 Later on the electrolysis according to the classic technology was done for the sake of comparison. The solution of sodium carbonate in the distilled water served as the electrolyte. The temperature of water raised by 1 degree within 10 minutes of operation. Constant producing of gas in the moderate volume used to be observed. 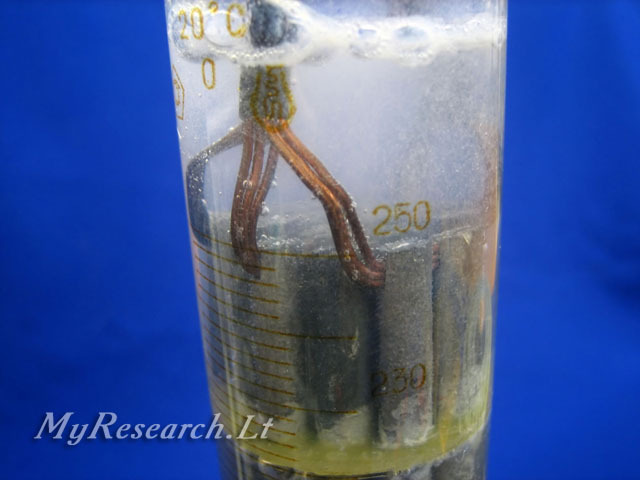 Comparison of the results proves low efficiency of the impulse electrolysis.